I do hate to go off on rants in the blog, but hey, if you don’t rant once in a while it’s not really a blog is it? I usually confine my moments of exuberance or frustration to relatively benign things like yogurt and recycling, but today’s events gave me the perfect opportunity to talk about something just slightly more controversial: camp fires. I mentioned in yesterday’s blog that we were being bugged by the smoke from fires in the state park campground. Each of the two evenings we were there—as I was shutting the windows and turning on the air conditioner to escape smoke blowing in—I was thinking that it would be great to get back to the open desert where our nearest neighbor would be hundreds of feet away and we could leave the windows open all night to let in the fresh air of the desert. Back at Clark Dry Lake, I set up the trailer almost gleefully on a flat spot near Brian and Leigh’s Airstream, and we had a very nice afternoon followed by a great little happy hour with B&L, Kyle and Mary, and some Canadians who were parked off in the distance in a fifth wheel. Bert Gildart dropped in for an hour or so, and it was fantastic to see him again. He and I talked about bicycle trips we would like to do next winter, and also the possibility of someday caravanning up to Alaska. Eleanor made dinner, or perhaps more properly re-made it from the numerous leftovers we had, and we ended up with a great smogasbord. We said goodbye to Bert (he left with a plate of food from Eleanor), and then … the folks about 200 feet to the east lit up a fire. It was just bad luck that the wind was perfect to carry the fumes from their fire directly to our Airstream, where we were sitting with every window open and the fans running. I don’t blame the people who lit the fire; they were perfectly within their rights to do so, and it wasn’t their fault that the wind was aimed at us. But the smoke was unbearable, and here we had no option to close the windows and run the A/C. After a few minutes of commiseration with Brian and Leigh (who apparently share our dislike of camp fires), we faced the only real choice we had. It was nearly dark. I had to move the trailer or spend the night sucking up the fumes. Already the inside of the Airstream was smelling like a Russian disco. 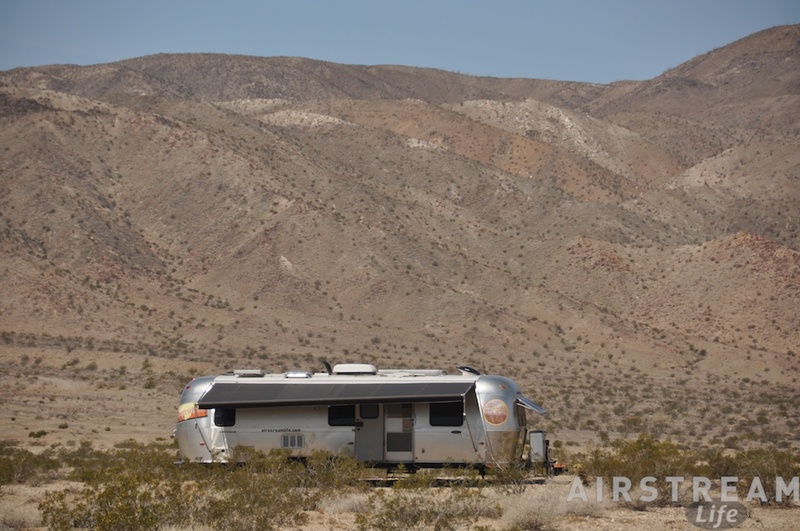 So we quickly threw everything into semi-towable mode, hitched back up, and gently towed the Airstream across the bumpy desert dirt roads a few hundred feet south to another open patch, safely out of the smoke path. It was almost embarrassing, skulking away in the dusk, even though we had not met the people with the fire. I didn’t want to explain that we were leaving because of them, but I could not escape the irony of our situation, and it made me think. I have to admit that in the past few years we have stayed at State Parks less than we used to, specifically because of camp fires. Eleanor had a massive migraine triggered by camp fire smoke years ago, and we don’t want to repeat that again. I am not physically affected by it, but I hate smelling it too. It pervades the interior, leaves a scent on everything, and masks the more delicate smells of the desert that gently waft through the air in the night. Sleeping with smoke in the trailer is nearly impossible for me because I keep thinking of fire and feeling that I’m suffocating. Many times we have come to a state park only to find neighbors who are obsessed with having fire 24 hours a day. They are always the worst at making fires, too. Day and night they dump green or wet wood in a hopeless pile, resulting in a constant stream of black smoke, no heat, and little flame. Sometimes they add to the fun by burning their garbage (thinking they are being ecologically responsible? ), which of course releases many interesting toxins from plastics, foils, and metals into the atmosphere. There is never any hope of negotiating, since for them the constant “fire” is paramount to their enjoyment, almost of religious significance, as if it was essential to life like it was for prehistoric man in that old movie “Quest For Fire.” Take away the fire, and you’ve ruined the experience for them. What’s the point of going “camping” if you can’t roast things on an open flame and come home reeking of wood smoke? But as I talk to people along the way, I’m finding that our feelings are far from unique. I have never met a full-timer who made camp fires, and many RV’ers never want them. They are a symbol of camping for the weekend set, and I know particularly for tenters that fires provide useful light at night, a little warmth, and a means to cook. The conflict comes between those rugged traditionalists who love them and people like us who don’t need them and avoid them. Even now, on those occasions about once a year when I break out the tent for a little “real camping” I never make a fire. I never did, having learned low-impact camping in the White Mountains of New Hampshire. Camp fires are strongly discouraged, even illegal, out there in the wilderness, because they leave long-lasting scars on the landscape, encourage scrounging of deadwood that serves a useful purpose in the local ecosystem, risk forest fires— and yes, create smoke that is annoying or unhealthy for animals and people alike. Even when tenting, we have always used a portable stove that is much safer, more useful, and simpler than a camp fire. I wish more people would. The terrible part of this is that our avoidance of camp fires inevitably means we must stay in commercial campgrounds more often, since they typically ban camp fires or don’t provide fire rings at the sites. I regret that. We’d rather be in the open as we are tonight, or in a beautiful and natural state park, if we can. I am not one to call for new rules to fit every circumstance so I stop at wishing for outright bans on camp fires, but it would be nice if there was at least an established etiquette about when and how to have them. In the meantime, we’ve got wheels and we’ll continue to use them. We’ve had a great week with our courtesy parkers Kyle & Mary & Kathryn. Now we are entering the second planned phase of our time together. Kyle & Mary hitched up the 34-footer and left early this morning for Anza-Borrego, and we are due to follow them on Monday. They left behind a souvenir: daughter Kathryn. She and Emma are virtually inseparable so we opted to keep Kathryn here for an overnight and let the two girls travel together in our car tomorrow. Having two of them hasn’t been much harder than having one, probably because they are keeping each other entertained, and so Eleanor and I have had time today to get serious about prepping the Airstream for travel. My projects aren’t done but the trailer is good enough. Kyle pitched in this week to help with building the new furniture, which was the last major project. By Wednesday I could see I wasn’t going to have time to complete it, but with Kyle’s help we at least had the first unit of three installed by Saturday. This first piece includes the laundry bin and shoe cubby. It took a while because we were working with salvaged pieces of lightweight plywood from the previous cabinet. This stuff is great, much lighter than ordinary plywood, and already laminated with the correct wood grain pattern that matches the rest of the trailer, so it was too good to just toss out. The black melamine plywood I had purchased earlier was too prone to chipping at the edges when cut, and even the black melamine edge banding was chipping when trimmed. It was never going to look good, so I abandoned the melamine plywood and came up with a scheme to use the lightweight Airstream plywood with solid aluminum strips as edge banding. A two-part epoxy turned out to be the best adhesive. Each piece had to be inspected, oriented so that prior holes and damage would be hidden, cut to size and length, then glued up with aluminum strips. Then we sanded the aluminum clean of blotches and sprayed clearcoat on it. The results were great but it took too long for a project that I had intended to complete before we hit the road. I kept the fold-out credenza as the centerpiece of the new furniture, and built around it. The salvaged strips became facia, trim, and legs. I used the black melamine plywood for interior shelves, since the chipped edges don’t show once everything is trimmed out. What you see in the picture is only about 1/3 of the final piece. To the right (rearward trailer-wise) of the laundry cabinet/credenza we’ll have a microwave cabinet, and further right we’ll have a recycling bin, plus some misc other storage. I’ll have to finish it later in April when we get back. The picture shows a temporary top made out of a scrap of MDF and quickly sprayed with polyurethane. The actual permanent countertop will be continuous all the way down the length of the trailer to the bulkhead you see in the background. This will be about six feet by 18 inches. We haven’t decided what we’re going to make it from, but I’ve got a few ideas. The balance of the weekend has been spent re-packing the Airstream. It’s 7 p.m. and we’re still not quite done packing but it will be done tonight with a few last-minute things to be done in the morning. The next two weeks or so will be on the road, so I’ll try to blog at least every other day as we go. For the past few weeks I’ve been working with Brett (and now Alice, the latest member of our team) to work out details for our new event, Alumaflamingo. It’s the fourth major event in our program, to be held next February. I talked about this a little before. We were asked by the Director of the former Florida State Rally (FSR) to come up with something new, because the FSR was finally disbanding after four decades. We stepped into the breach, and now we’re committed. It’s a little nerve-wracking because it’s a lot of work and we have no assurance at this point that we won’t lose our shirts financially. But if we hadn’t stepped up, there would be no major Airstream-oriented rally to replace FSR in 2014. So it seems to be worth some extra effort and risk. When you step in to replace something that’s been going on for decades and has lots of loyal customers, it’s inevitable that the rumor mill will start up, and there’s a tendency that many of the rumors will be unflattering. We expected a certain amount of this, and it’s OK. We understand that people might feel threatened by change. For example, people who had gotten comfortable with the super-cheap rally fee of FSR ($220 per couple) may be upset that Alumaflamingo will cost $335. But if we ran the same event as FSR, we’d be facing the same slide in attendance that it suffered over the past several years. As they say, doing the same thing but expecting a different result is an exercise in futility. So we are trying to upgrade the event to meet modern expectations, which means adding in more activities, better food, better informational seminars, more vendors, better entertainment, etc. People who went to FSR primarily because it was cheap will probably be unhappy with any price increase, and choose to go elsewhere. But on the other hand, people who stayed away because they didn’t think it offered enough fun & education will hopefully give Alumaflamingo a try. Our past three years of experience at Alumapalooza seems to support this. In the past few weeks I’ve heard some pretty wild rumors. One guy was saying he wouldn’t go because we wouldn’t have liability insurance. When asked why he believed this, he said he’d been told by “people.” For the record, the Fairgrounds requires us to have a significant liability insurance policy, so that rumor was nonsense. Another common rumor has been that our event will not be “an Airstream event” or somehow will be polluted because our policy is to allow non-Airstreams to attend. That one really kills me. We allow non-owners to attend because we figure anyone wants to come to an Airstream-centric event must be considering buying an Airstream. These people are future members of our community, so we think it’s a good idea to let them know they are very welcome. At Alumapalooza, we usually get about 4-5 “white boxes” attending, out of about 200 trailers. In Sarasota we expect about the same. So 98% of the rigs on the field are Airstreams, there’s an Airstream dealer selling trailers, Airstream Inc. is present and providing service, we’ve got at least a dozen Airstream-specific seminars, and the event is sponsored by Airstream Life magazine. Yeah, I’d say that qualifies as an Airstream event. Another common rumor is that casual visitors to the event will have to pay to get in. I don’t know why people think that. I guess I’ll have to update our FAQ pages to specifically address this issue. Of course friends can visit at no charge. There’s no gate at any of our events. We only charge admission to people who want to camp, join the activities, eat the meals, or attend the programs & entertainment. Dropping in and taking a look, or visiting with friends, or shopping for an Airstream with the sponsoring dealer is always free. Perhaps the most painful rumor we hear is that the demise of FSR (and decline in attendance for certain other club rallies) means that the WBCCI is doomed. We don’t believe this. We think the WBCCI will continue as a viable club even if some major events are organized by third parties. 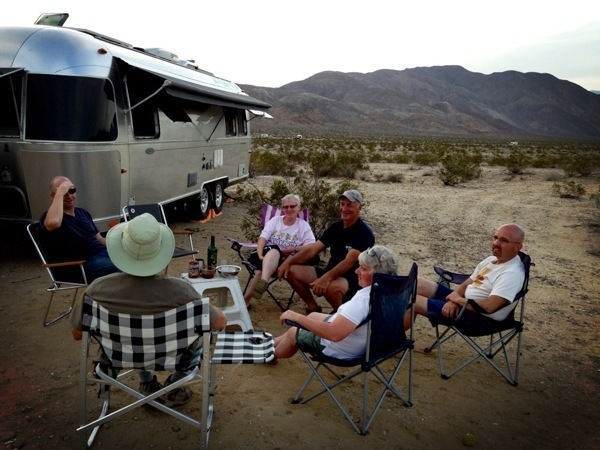 The club represents the history of Airstream, many of the most enthusiastic and supportive owners, and it remains an important means for Airstreamers to meet in person, travel together, and share experiences. Sure, Alumaflamingo is not an official WBCCI event. But why does that matter? The club is more than welcome. In fact, at Alumaflamingo we are giving the Region 3 officers meeting space so that they can conduct some of their official activities on site. They can even publish their own event schedule for members or officers, if they like. They get all the benefits of the FSR, without all the work. Makes sense to me. This means that we regard WBCCI as a partner and are looking forward to working with our friends in the club for many years to come. By launching Alumaflamingo, we’re hoping to be part of the road forward. It may not be a comfortable road for us until the dust settles, but it’s exciting to contribute to positive change.